It is our mission to provide a safe, healthy and enjoyable opportunity for young athletes to learn and compete in the game of lacrosse. There will be opportunities for players of all abilities to participate with others of similar skills in all age groups. Our goal is to set and maintain a high standard of sportsmanship, ethics, and integrity throughout StickWithUs programs. Since its inception in 2001 StickWithUs.org has been dedicated to the creation of first class leagues, teams, and events for youth through high school boys and girls in the greater Charlotte, North Carolina area. The roots of our youth lacrosse curriculum were developed and first taught by ex-Charlotte resident and former University of Pennsylvania Head Coach, G.W. Mix. Coach Mix’s coaching principals and belief in fundamental skill development, have become the cornerstone of our programs and have built StickWithUs into one of the most respected youth programs in the Carolina’s. 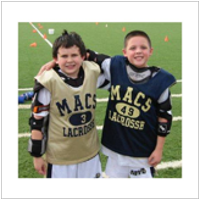 StickWithUs started as Mecklenburg Youth Lacrosse (MYL) in the spring of 2001. That year 83 third, fourth & fifth-grade boys, participated in a “skill development” camp-like atmosphere. With the help of dedicated Charlotte area high school & middle school lacrosse coaches and numerous parent volunteers, StickWithUs grew into year-round programs for boys and girls from first grade through high school, with emphasis on skill development and participation in multiple sports, the StickWithUs staff of professionals & volunteers has built the program into one of the most respected lacrosse organizations in the Carolina’s.